From lonesome lighthouses to roaming elephants, a luxury yacht vacation in Croatia’s secluded islands can still be packed with surprises, say Tristan Rutherford and Kathryn Tomasetti Croatia’s islands have not always been accessible. 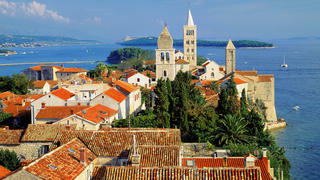 Bickering Austrian and Venetian overlords left Gothic towers and soaring campaniles across Dalmatia – then prohibited strangers from sailing in. Some top secret escapes remained off limits until the past few decades, such as the Brijuni Islands, which used to be a presidential retreat, and Lastovo, which was a Yugoslav submarine base. Even tiny Vis was only opened to the public in 1989. The tourism bug has now bitten Croatia hard – one in every six euros the nation makes comes from its travel sector. Today, Vis has a daily ferry to the mainland and a host of A-list habitués. Fortunately, the country has 1,200 other islands, islets and tiny havens in the middle of the sea to explore. The only requirements are a private yacht, a tube of suncream and a pair of swimming trunks. 1. Palagruža Location: An isolated speck in the centre of the Adriatic Off the radar rating: 5/5 Palagruža takes its name from the Greek word pèlagos, meaning sea. It resides in its own Adriatic bubble of infinite blue, as far as you can get from the Croatian mainland. Whether you feel envious of, or sorry for, the island’s lighthouse keeper is a matter of opinion. Either way he welcomes sailors – and the occasional paying guest – into his airily capacious tower on the island’s 90 metre summit. As Palagruža marks Croatia’s southernmost point a unique microclimate pervades, with the nation’s lowest rainfall (just 30cm a year) and wind direction changing multiple times a day. The waters are teeming with sea life and fishermen often flock to the area. A geographical fluke forced Palagruža and Mala (Little) Palagruža – and another dozen or so rocky specks – to rise from the Adriatic seabed. Before GPS, sailors would easily miss them. The captain should call the lighthouse on Channel 16 for mooring details and embarkation directions to the shingle beach. Croatia’s islands have not always been accessible. Bickering Austrian and Venetian overlords left Gothic towers and soaring campaniles across Dalmatia – then prohibited strangers from sailing in. Some top secret escapes remained off limits until the past few decades, such as the Brijuni Islands, which used to be a presidential retreat, and Lastovo, which was a Yugoslav submarine base. Even tiny Vis was only opened to the public in 1989. The tourism bug has now bitten Croatia hard – one in every six euros the nation makes comes from its travel sector. Today, Vis has a daily ferry to the mainland and a host of A-list habitués. Fortunately, the country has 1,200 other islands, islets and tiny havens in the middle of the sea to explore. The only requirements are a private yacht, a tube of suncream and a pair of swimming trunks. Palagruža takes its name from the Greek word pèlagos, meaning sea. It resides in its own Adriatic bubble of infinite blue, as far as you can get from the Croatian mainland. Whether you feel envious of, or sorry for, the island’s lighthouse keeper is a matter of opinion. Either way he welcomes sailors – and the occasional paying guest – into his airily capacious tower on the island’s 90 metre summit. As Palagruža marks Croatia’s southernmost point a unique microclimate pervades, with the nation’s lowest rainfall (just 30cm a year) and wind direction changing multiple times a day. The waters are teeming with sea life and fishermen often flock to the area. A geographical fluke forced Palagruža and Mala (Little) Palagruža – and another dozen or so rocky specks – to rise from the Adriatic seabed. Before GPS, sailors would easily miss them. The captain should call the lighthouse on Channel 16 for mooring details and embarkation directions to the shingle beach. Location: Royal favourite nestled behind the Istria peninsula Off the radar rating: 2/5 This former Venetian outpost had an unanticipated 15 minutes of fame in 1936 when the new King Edward VIII visited on board 91 metre Nahlin, which he had chartered for a spin around the Adriatic with his married lover Wallis Simpson. “The royals sashayed along our island’s quays in white suits,” says island tourism chief Luka Perčinić. Edward and Wallis then took a tender to Kvarner beach on Rab’s southern shore. Daring Simpson reportedly stripped off, causing the world’s first royal skinny dip sensation. Rab’s 150 kilometres of hiking and biking trails, which criss-cross the bucolic interior, are recommended, as is a prior call to the harbourmaster, who in 2016 hosted his busiest ever superyacht season. This former Venetian outpost had an unanticipated 15 minutes of fame in 1936 when the new King Edward VIII visited on board 91 metre Nahlin, which he had chartered for a spin around the Adriatic with his married lover Wallis Simpson. “The royals sashayed along our island’s quays in white suits,” says island tourism chief Luka Perčinić. Edward and Wallis then took a tender to Kvarner beach on Rab’s southern shore. Daring Simpson reportedly stripped off, causing the world’s first royal skinny dip sensation. Rab’s 150 kilometres of hiking and biking trails, which criss-cross the bucolic interior, are recommended, as is a prior call to the harbourmaster, who in 2016 hosted his busiest ever superyacht season. Location: Historic hidden archipelago in the Adriatic Off the radar rating: 5/5 Off limits to foreigners until the late 1980s, Lastovo remains delightfully isolated. An archipelago of 46 islets, it claims just 800 year-round residents. Little wonder that its main island was used as a base for Yugoslav submarines during socialist times. History lovers can drop anchor among the idyllic inlets of Lastovo’s western coast to hunt down the remaining concrete pens, and the brave can go snorkelling with underwater torches. North of here, translucent waters ripple over a mosaic of multicoloured pebbles and call out for exploration by paddleboard. Stretch your sea legs along the 200 kilometres of paths that meander around the islands. Then, come nightfall, Lastovo’s clear skies make for some of the finest stargazing in Europe. 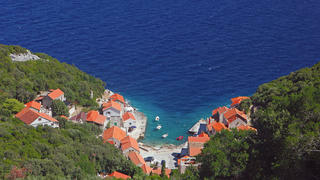 Off limits to foreigners until the late 1980s, Lastovo remains delightfully isolated. An archipelago of 46 islets, it claims just 800 year-round residents. Little wonder that its main island was used as a base for Yugoslav submarines during socialist times. History lovers can drop anchor among the idyllic inlets of Lastovo’s western coast to hunt down the remaining concrete pens, and the brave can go snorkelling with underwater torches. North of here, translucent waters ripple over a mosaic of multicoloured pebbles and call out for exploration by paddleboard. Stretch your sea legs along the 200 kilometres of paths that meander around the islands. Then, come nightfall, Lastovo’s clear skies make for some of the finest stargazing in Europe. Location: Glamour magnet within paddleboarding distance of Hvar Off the radar rating: 3/5 From British aristocracy to Hollywood royalty, hip island getaway Hvar has been luring A-listers for more than a century. But Sveti Klement, a five minute boat ride away, also known to sailors as Palmižana, hums along in a lower key. Venetian professor and local landowner Eugen Meneghello safeguarded the island in 1906 by planting a botanical garden, transforming it into an eco paradise that still flourishes today. With a scattering of private coves, Sveti Klement is laced with aloe- and agave-trimmed hiking paths and is peacefully car-free. Meneghello’s great-granddaughter Tarin offers her favourite island secret: “Even if you can’t stay on the island, moor up and eat at my brother’s seafood restaurant, Toto’s.” Epicurean visitors should also pop into the gourmet beach bar Laganini, where award-winning chef Hrvoje Zirojević dishes up swordfish carpaccio with orange and sun-dried tomatoes and roasted octopus to the likes of Bono. From British aristocracy to Hollywood royalty, hip island getaway Hvar has been luring A-listers for more than a century. But Sveti Klement, a five minute boat ride away, also known to sailors as Palmižana, hums along in a lower key. Venetian professor and local landowner Eugen Meneghello safeguarded the island in 1906 by planting a botanical garden, transforming it into an eco paradise that still flourishes today. Epicurean visitors should also pop into the gourmet beach bar Laganini, where award-winning chef Hrvoje Zirojević dishes up swordfish carpaccio with orange and sun-dried tomatoes and roasted octopus to the likes of Bono. Location: Archipelago of natural wonders off Pula Off the radar rating: 3/5 So stunning are the Brijuni Islands that a century ago a Viennese business magnate founded Croatia’s first beach club here. After the Second World War, their strategic location, as well as the Italian-built hotels and casino, attracted Yugoslav president Josip Tito. 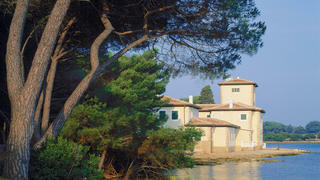 The pine-fringed archipelago – now a national park and UNESCO World Heritage Site – became Tito’s private retreat until 1980. Among his visitors was former Indian prime minister Indira Gandhi, who presented two elephants, one of which roams the main island today alongside antelope and mountain zebras. Grand homes and crumbling fortifications can still be seen today, as well as Tito’s Cadillac. The islands are also home to more than 600 indigenous plant species, which can be viewed from a network of island paths. So stunning are the Brijuni Islands that a century ago a Viennese business magnate founded Croatia’s first beach club here. After the Second World War, their strategic location, as well as the Italian-built hotels and casino, attracted Yugoslav president Josip Tito. The pine-fringed archipelago – now a national park and UNESCO World Heritage Site – became Tito’s private retreat until 1980. Among his visitors was former Indian prime minister Indira Gandhi, who presented two elephants, one of which roams the main island today alongside antelope and mountain zebras. Grand homes and crumbling fortifications can still be seen today, as well as Tito’s Cadillac. The islands are also home to more than 600 indigenous plant species, which can be viewed from a network of island paths. Location: Adriatic to the left, uninhabited islands to the right Off the radar rating: 4/5 George Bernard Shaw, who visited Croatia in the 1920s, said: “On the last day of the Creation, God desired to crown His work and thus created Kornati Islands out of tears, stars and breath.” Thankfully little has changed since then. The 140 Kornatis make up 12 per cent of Croatia’s total islands and they have all been safeguarded for nearly 40 years as a land and sea national park. Cruising through these 318.5 square kilometres of azure sea and emerald isles is sheer joy. Many islands are populated only by butterflies, allowing you to play Robinson Crusoe – albeit with iced beers on demand. Under the sea, it’s a kaleidoscope of colour with 60 species of coral, loggerhead turtles and 200 species of fish – and the daily scuba permit fee is just £1.20. George Bernard Shaw, who visited Croatia in the 1920s, said: “On the last day of the Creation, God desired to crown His work and thus created Kornati Islands out of tears, stars and breath.” Thankfully little has changed since then. The 140 Kornatis make up 12 per cent of Croatia’s total islands and they have all been safeguarded for nearly 40 years as a land and sea national park. Cruising through these 318.5 square kilometres of azure sea and emerald isles is sheer joy. Many islands are populated only by butterflies, allowing you to play Robinson Crusoe – albeit with iced beers on demand. Under the sea, it’s a kaleidoscope of colour with 60 species of coral, loggerhead turtles and 200 species of fish – and the daily scuba permit fee is just £1.20. Location: A silent forest lost in the Dalmatia region Off the radar rating: 3/5 The last stop before Italy, Mljet is a verdant national park so quiet that a group of monks still call the island home. Captain Ryan Fitzgerald, of 50 metre Liberty, which charters through Northrop & Johnson, knows it well. “Every inlet has so many little places where you can tie up stern-to and feel like you are actually in the forest,” says Fitzgerald. The prohibition on toys is another plus. “The speed limit and Jet Ski ban by park authorities help to keep it feeling totally natural,” he adds. For activity, Fitzgerald recommends the bike trails through Mljet’s 98.4 square kilometre interior. You can also visit the picturesque lake that surrounds the Santa Maria monastery or the egg-shaped Odysseus Cave. On the island’s southern tip, the sands of Saplunara glow gold. Visit seafood eatery Konoba Stermasi and indulge in crab tartare and amberjack sashimi, then explore the sandy-bottomed lagoon and the two swim-to islands offshore. 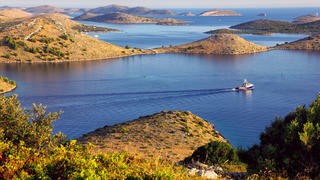 The last stop before Italy, Mljet is a verdant national park so quiet that a group of monks still call the island home. Captain Ryan Fitzgerald, of 50 metre Liberty, which charters through Northrop & Johnson, knows it well. “Every inlet has so many little places where you can tie up stern-to and feel like you are actually in the forest,” says Fitzgerald. The prohibition on toys is another plus. “The speed limit and Jet Ski ban by park authorities help to keep it feeling totally natural,” he adds. For activity, Fitzgerald recommends the bike trails through Mljet’s 98.4 square kilometre interior. You can also visit the picturesque lake that surrounds the Santa Maria monastery or the egg-shaped Odysseus Cave. On the island’s southern tip, the sands of Saplunara glow gold. Visit seafood eatery Konoba Stermasi and indulge in crab tartare and amberjack sashimi, then explore the sandy-bottomed lagoon and the two swim-to islands offshore. Location: Pristine wilderness sitting between Zadar and Italy Off the radar rating: 4/5 Ancient natives lived on this luxuriously long, green tongue of land, eating olives, collecting mussels and making rudimentary wine. Population growth has been so slow since then that just 1,500 locals now call Dugi Otok home; dive in from the sun-kissed pebbles at Veli Žalor or into the rock pools at Brbinj and yours could be the only towel on the beach. Captain Tom Filby, of 44 metre Blue Vision, available to charter with Camper & Nicholsons, is a fan. 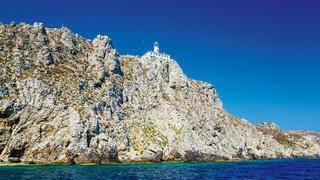 “Several tiny islands mark a route from the main bay of Dugi Otok,” he says. “Here you’ll have the tranquil island bay of Luka Telašćica entirely to yourself.” Head to Saharun, a powder sand beach on Dugi’s northern tip, for a mellow beach bar. Ancient natives lived on this luxuriously long, green tongue of land, eating olives, collecting mussels and making rudimentary wine. Population growth has been so slow since then that just 1,500 locals now call Dugi Otok home; dive in from the sun-kissed pebbles at Veli Žalor or into the rock pools at Brbinj and yours could be the only towel on the beach. Captain Tom Filby, of 44 metre Blue Vision, available to charter with Camper & Nicholsons, is a fan. 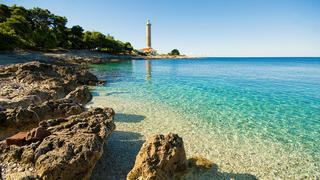 “Several tiny islands mark a route from the main bay of Dugi Otok,” he says. “Here you’ll have the tranquil island bay of Luka Telašćica entirely to yourself.” Head to Saharun, a powder sand beach on Dugi’s northern tip, for a mellow beach bar.